How can change the order of a category? To change the order of a category in the navigation area, use the up and down arrow buttons to move the category`s placement within the navigation links on your web site. Black arrows designate the main categories. Gray arrows designate subcategories. White arrows designate end categories. 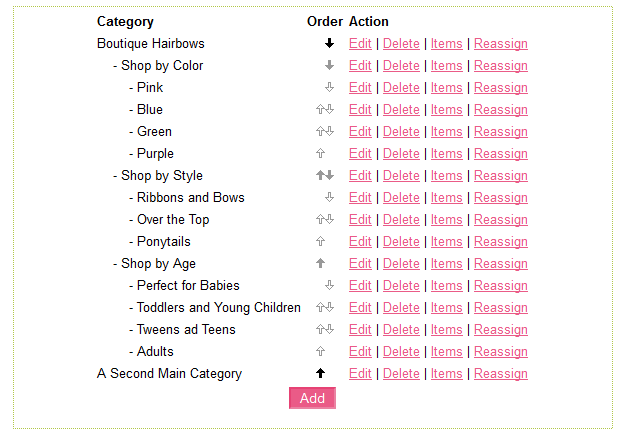 You can reorder any main category, subcategory, or end category as needed, by clicking the arrows one at a time until the desired order is set. How do I activate built in page(s)? How can I view my best selling products? How do I add my products? How can I set default item(s)?